In the event of a release or potential release of chemicals into soil and groundwater, an adequate characterization of the extent of the release is of paramount concern for business owners. 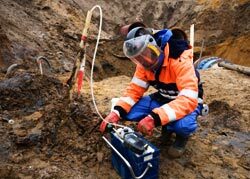 Soil and groundwater sampling is necessary to fully delineate the plume of contamination, if present. This work might include drilling to advance soil sampling equipment, setting groundwater monitoring wells, and analyzing soil and groundwater samples for a variety of potential environmental contaminants. Upon completion, the data generated by the sampling activities can then be compared to the existing standards to characterize the magnitude and severity of the release and the associated scope of a response action. Environmental Support Network, Inc. has the skill, education, and experience necessary to present a realistic sampling program that characterizes the needs and requirements of the project.